With regards to servicing and restoring Clocks and Watches, all mechanical timepieces must be attended to on a regular basis. Most clocks will typically run for ten to fifteen years without giving any indication they need servicing. As time passes, dust accumulates within the movement adhering to the lubrication placed on all moving parts to minimize friction. The difficulties that arise occur when the dust accumulates to a point where it becomes dirt. Dirt creates an abrasive environment where the steel pivots of the gears slowly wear the holes in which they turn in. If one believes that a clock is something that can be cherished for a lifetime and then passed on to the next generation, it must be cleaned on the average of five to seven years. All old lubrication along with the accumulated dirt must be removed before new lubrication is applied to the clock. IF YOU ARE HAVING YOUR CLOCK SERVICED, PLEASE CONFIRM THAT IS BEING CLEANED AND NOT JUST OILED. 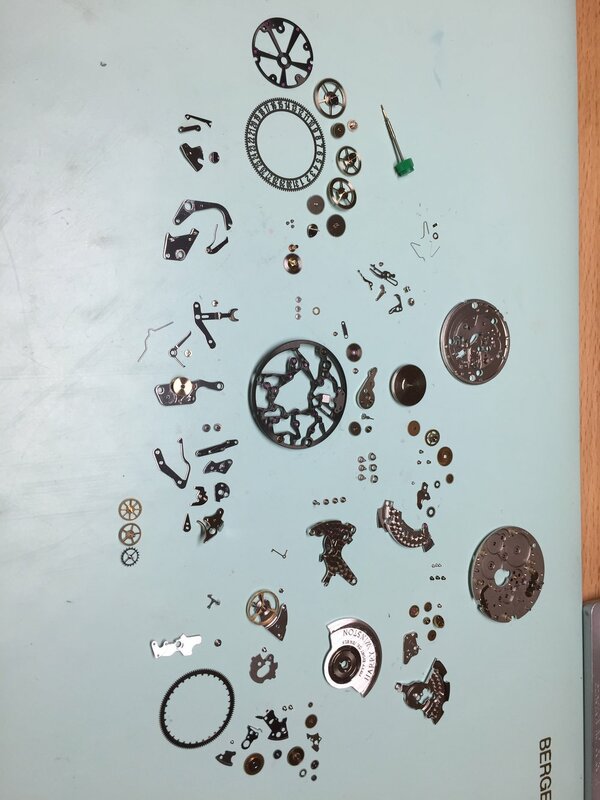 IT IS IMPERATIVE TO NOT OIL A CLOCK MOVEMENT IF IT HAS BEEN RUNNING FOR FIVE YEARS OR LONGER WITHOUT HAVING IT PROFESSIONALLY CLEANED FIRST. THIS CLEANING CANNOT TAKE PLACE IN ONES HOME. IF THE OLD OIL AND DIRT IS NOT REMOVED FIRST, ADDING NEW OIL WILL ONLY ACCELERATE THE WEAR ON THE DRIVE TRAIN. Grandfather clocks require a home visit where the movement, weights and pendulum are removed and brought back to our shop. The movement is completely disassembled, cleaned, repaired and tested. Upon proper functioning, the components are returned to your home. Any worn or damaged components, such as cables, are repaired or replaced at cost value. In addition to overhauls, we preform set-ups, check-ups (between cleanings), packing, moving, and sales. Please call us to schedule an appointment at 201-664-4828. We service all antique and modern wall and mantle clocks of all makes. These include: regulator clocks, school house clocks, cuckoo clocks, anniversary clocks, french clocks, morbiers, banjo clocks, tambour clocks, bracket clocks, fusse chain clocks, ships clocks. Prices vary based on condition, style and make. Stop by our shop to receive a free estimate. Please remember to remove the weights, if there are any, remove or tape (blue painters tape) the pendulum, and remove any pieces that come off. Most repairs are completed within two weeks. We also repair quartz clocks. Same day service is available for most quartz timepieces. We service both modern and vintage watches. Everything can be done: from battery services to complete overhauls and restorations. We now offer watch straps as well. Feel free to stop by and let us take a look. Estimates will be done within a week, and repairs done approximately 2-4 weeks (or more depending on parts availability).